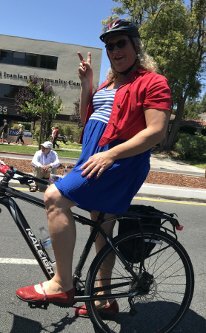 Rose, White, and Blue Parade July 4th, 2018. The theme for the Rose, White, and Blue Parade was "Patriotic Star Wars". I showed up with Princess Leiah on the back of the tandem. 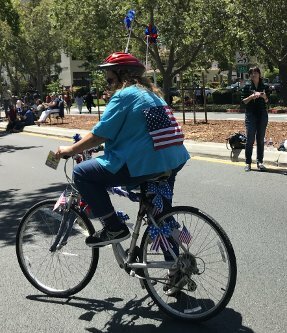 At the start of the ride they had a table full of red, white and blue bunting and other bling. 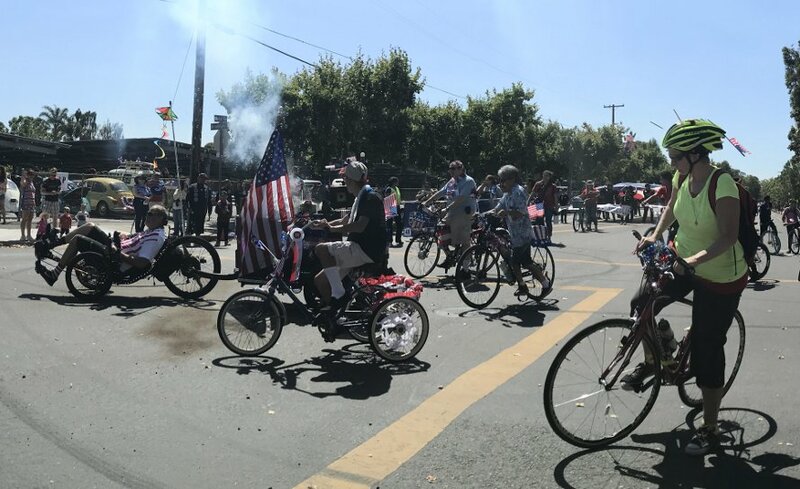 Bit by bit, we added more to the tandem until it looked very patriotic. 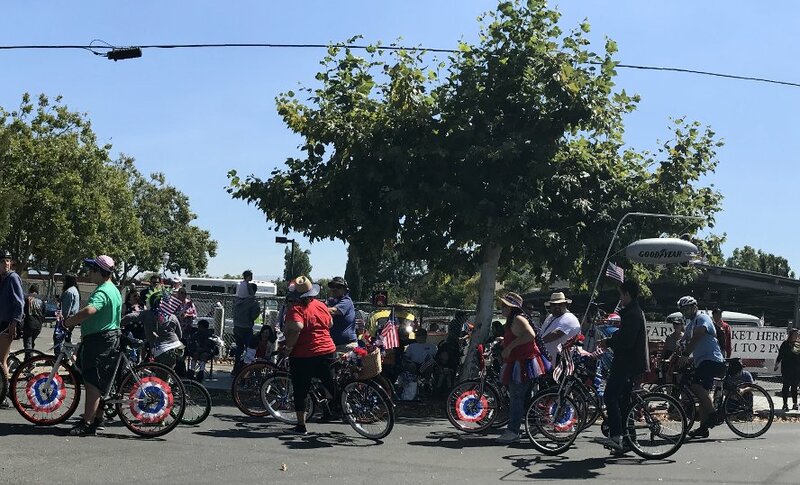 Somebody announced that there would be three groups of bike party types in the parade. 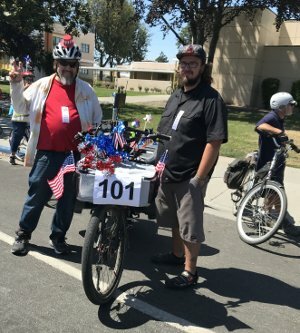 First group, a kids ride would lead the parade with two music bikes, Enrique and Juan. 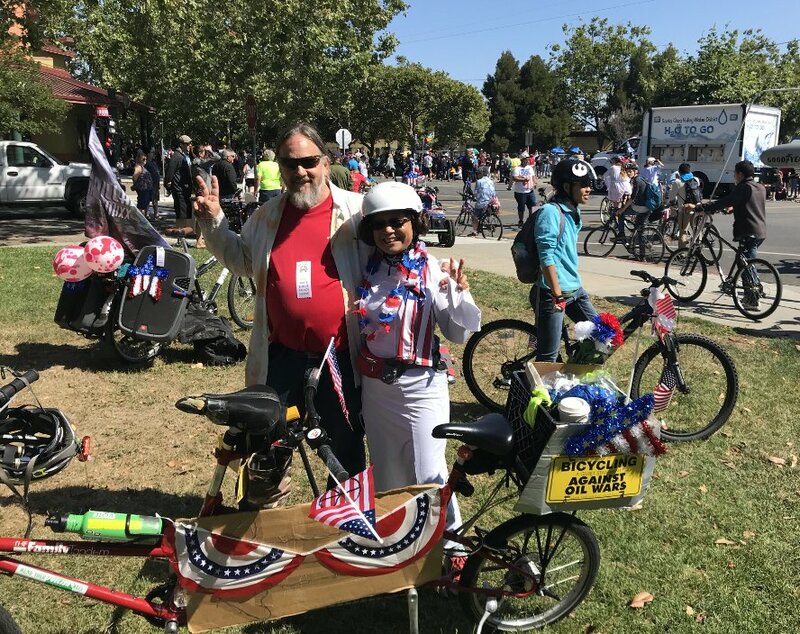 Then we'd have a group in the middle of the parade with two music bikes, Booble and Roy. The third group had Jonathan and Pei Mei for music bikes and the rest of the riders. We didn't get a picture of the first group to roll out. These pictures were the next batch. 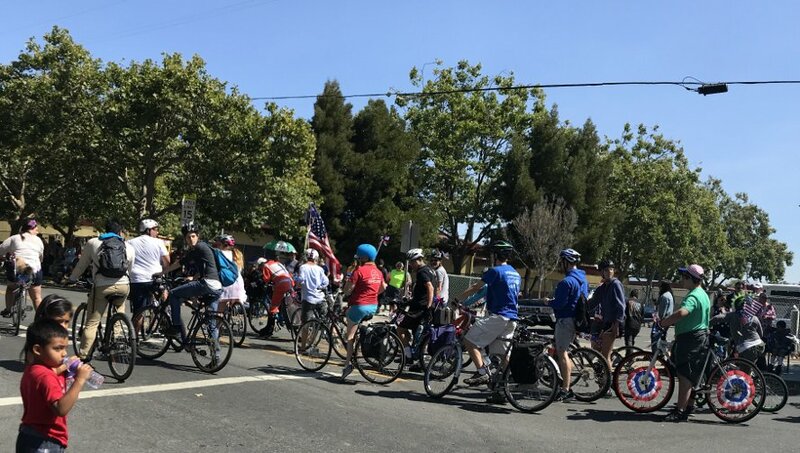 Turns out most of bike party joined the middle wave. They had been waiting for a long time to roll. The group that hung back for the third wave (parade group ID: #101) wasn't much. Should have gotten a better picture of Pei Mei. 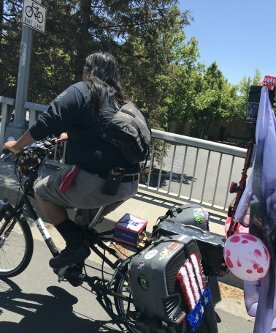 He's the one hauling those two huge speakers on a cargo bike with a grey and white flag. 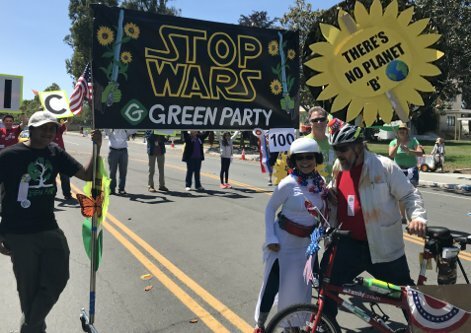 Turns out that parade group 100 was the Green Party! 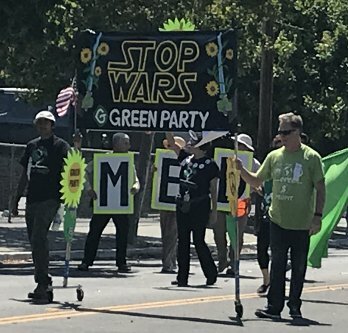 The Greens had added the "STOP WARS" banner to honor the star wars theme. Had to get our picture taken with that! It's kind of hard to tell from our pictures, but that's Gayle McLaughlin, whom I voted for in the spring primary Lt. Governor of California race. 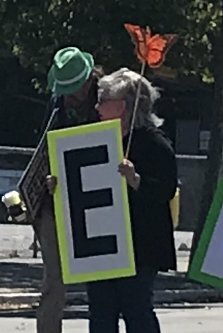 She marched with us! 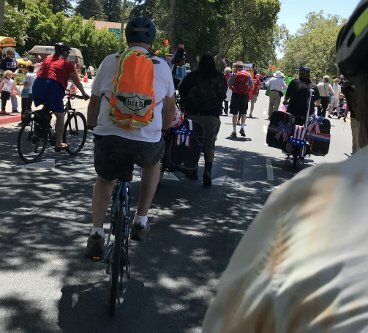 We followed about ten feed behind the Greens, two huge sound systems and half a dozen other random riders just enjoying the experience. It was impossible for the Greens to ignore us. I could see them dancing to the music on such anti war anthems as "I ain't no fortunate son" from CCR. They didn't say much though. 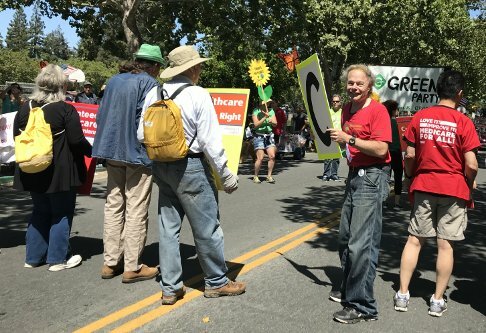 Somehow, it made the parade much better for me to know we were putting some "party" in behind the Green Party. Still smiling over that one. After the parade these riders found a guy with a photo booth on the back of another pedal powered contraption. I didn't get a picture of that, but he took a group shot of whatever bike partiers happened to be there at the time. This is a picture of the copy of that Virginia got that I took later. The quarter is there to show scale.